The idea of using couplings (rather than welding or wire-tying) to connect lengths of rebar has been around for decades. 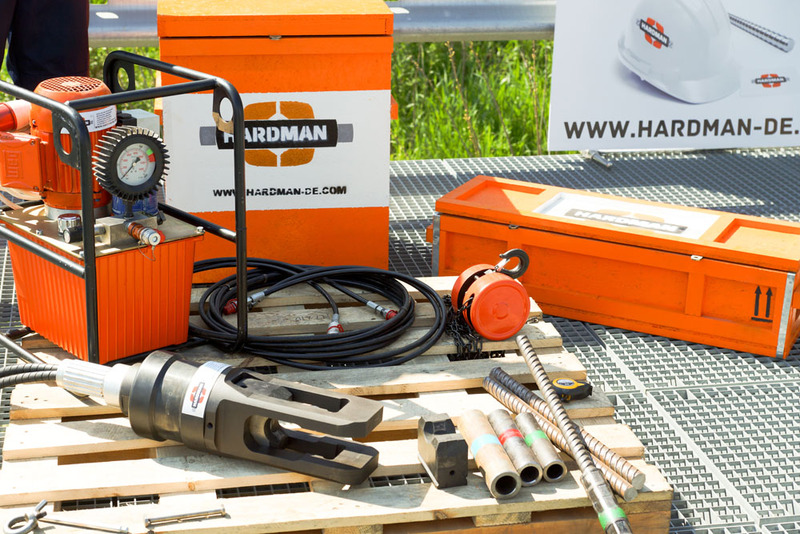 But in 2007, Hardman-De & Co designed and developed a rebar coupler and pressing method that remains the fastest, safest and most reliable way to connect two lengths of rebar - even of differing diameters - in any space or position. Hardman couplers preserve perfect rebar alignment without inconvenient threading, and each coupler has a centered “jump” that ensures perfect placement every time. The included mechanical pressing system is fully portable, simple to use, and produces a reliable splice that increases the breaking strength of two joined lengths of rebar by 20-25 percent - and reduces your construction time and rebar overrun costs by many times more. Hardman provides a full-service solution: couplers, in a full range of sizes (D10 — D40) or (D3/8" — D1 5/8"); a portable mechanical pressing system that makes installation simple and efficient; and 24-hour access to technical support and replacement parts. No specialized or craft workers are required - we’ll train your crews on-site, in less than a day! All components are made especially for us in Germany and assembled in Ukraine - letting us offer you the highest-quality couplers and joining equipment at the best possible price. From sales to suppport, we have built a team here at Hardman that can solve any problem - and keep your project going non-stop. Build faster, build better... the Hardman way!